In Exchange server Send Connectors are used to route messages from the Exchange organization to external recipients. Routing is based on the namespace of the recipient. You can create an Internet Send Connector with a namespace “*”, which means that all outbound messages are routed via this Send Connector. You can also create a separate Send Connector with a namespace “fabrikam.com”. All messages with destination user@fabrikam.com are sent via this Send Connector, all other messages are sent via the other Send Connector. Routing via specific smart hosts or implementing domain security (i.e. Forced TLS) are good examples of using dedicated Send Connectors. In Exchange unfortunately it is not possible to route message based on (properties of) the sender in Exchange. For example, users in a communications department should send all messages via a dedicated, high priority Send Connector, or members of the Sales Group should always send their messages via smarthosts in the DMZ, while other users send their messages via Exchange Online Protection. You can think of various examples, specific for your organization. A customer wanted to implement source-based routing. 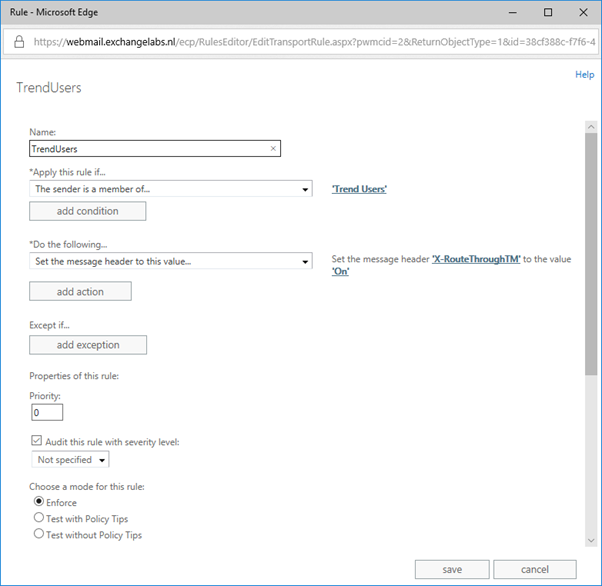 Based on Active Directory Group membership or a property in Active Directory, outbound email should either be routed via the Symantec Messaging Gateway (SMG) or via Exchange Online Protection. In Exchange you need a 3rd party solution, and one of the 3rd party solutions is the Transport Agent of Egress Software Technologies (www.egress.com). 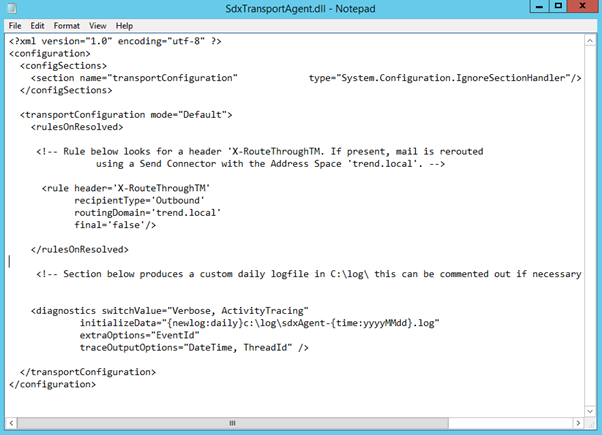 The Egress Transport Agents is a small software package that is installed on the Exchange 2010 Hub Transport server, of the Exchange 2013/2016 Mailbox server. It can also be installed on an Edge Transport server. It is installed in the C:\Program Files\Microsoft\Exchange Server\V15\TransportRoles\agents\SmtpAgents directory, and the Transport Agent is configured using a configuration file. In my lab environment I’ve installed it on two Edge Transport servers (one Exchange 2013 and the other Exchange 2016). I can route messages via Trend Micro Hosted Email Security (HES) or directly via the Edge Transport servers. Of course, there are two Send Connectors to facilitate each route. 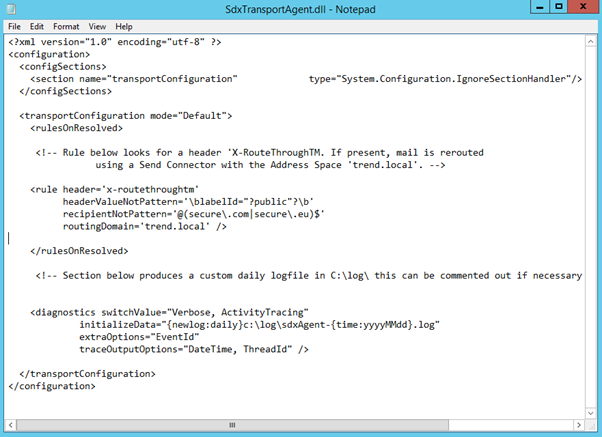 The Edge Transport servers make a routing decision based on a header in the email message. If the message contains a header ‘X-RoutethroughTM’ the message is routed via Trend Micro HES, if this x-header is not present it is routed via the regular Send Connector. 2018-04-19T10:25:05.9304328Z TID=24 ID=13307 > Rule #1. Recipient [jaapwess@gmail.com]. Rerouted to [trend.local] via [UseOverrideDomain]. 2018-04-19T10:25:05.9304329Z TID=24 ID=13308 [#016636d20b19] Event: [OnResolved]. Message ID= processing completed. Result: [Routed]. 2018-04-19T10:24:56.1352083Z TID=48 ID=13307 > Rule #1. Header [x-routethroughtm] was not found. 2018-04-19T10:24:56.1352084Z TID=48 ID=13308 [#1f1e25edd0da] Event: [OnResolved]. Message ID= processing completed. Result: [NoAction]. Note. Unfortunately I was not able to post the config info itself on my blog, as WordPress does not accept this. In this example, all messages with the X-RouteThroughTM header are routed to the trend.local connector. However, if the X-RouteThroughTM header has label “public”, do not route. Also, do not route for recipients in @secure.com and @secure.eu domains. Source Based Routing is not possible in Exchange server and you need a 3rd party solution to achieve this. The Transport Agent solution from Egress Software is a highly customizable tool that can achieve this and the last couple of months it has been proven to be stable. The Exchange servers themselves need to be running Windows 2012 or Windows 2012 R2. At the time of release Windows Server 10 is not supported. There’s also something like Simplified Architecture. This is the Exchange 2013 Preferred Architecture, enforced on Exchange 2016. This means that there will be only one Exchange 2016 server role on the internal network, the Exchange 2016 Mailbox server. This is the same as the old Exchange 2013 multi-role server, but at this moment there’s no choice left. You have to install the Exchange 2016 Mailbox server, and you cannot opt to install a dedicated Client Access server anymore.